No time to read?! This audio book is available for downloadable purchase at the links below for convenient listening anytime — day or night, at home or on the go! Now you can go about your day while also learning how to strengthen your marriage intimately. Although this page shows a price of $0.00, it is not a regular product purchase page, but an informational page to provide links to where you can purchase the downloadable audio through other outlets each with their own pricing. This downloadable audio book is not directly available from this Strengthening Marriage Online Store. You must click on the links provided to purchase. Finally! a book about physical intimacy and marital ONEness that is comprehensive, in-depth and frank, yet still respectfully reverent. 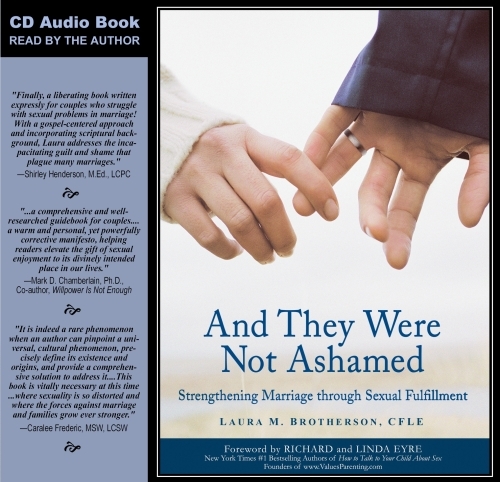 And They Were Not Ashamed–Strengthening Marriage through Sexual Fulfillment by Laura M. Brotherson is the ultimate how-to handbook–power-packed with hope and help for creating a mutually fulfilling intimate relationship. Provides principles and practices to help parents teach and better prepare their children for intimacy and lasting fulfillment in marriage. Read Sexual Success Stories of other customers.